Manufactured in the USA for decades, mechanical flashers have been the workhorse of the lighting industry. In the beginning, units featured simple on-off function. The product line quickly expanded to include flashers that perform a wide variety of functions including chasing, spelling, scintillating and other effects. The design and technology used on mechanical flashers is no longer new, yet they continue to offer distinct advantages because of their design simplicity and reliable long term performance under varying operating conditions. The Model 1 Flashers are the most basic in the product line. These units are powered by a synchronous motor that drives one or two cams at a constant speed of 5 seconds per revolution, or 12 revolutions per minute. The cams in turn open and close contact points. Actual flashing speed is a function of the cam cut. For example, a four lobe cam would yield on-off action 48 times per minute. Several cam cuts are available from stock and custom cam cuts are available per your request. *This unit control's the primary voltage. This unit is NOT for flashing secondary high-voltage current. *115 volt motor, 50/60 cycle. *Dimensions: 3 1/2" x 4" x 3"
*Units are UL & cUL (Canadian UL) Listed. *Dimensions: 5" x 4 1/2" x 3"
The Model 55 is specifically designed to distribute the secondary voltage of a neon transformer. The unit will handle from 7,500 to 15,000 volts and distribute this high voltage to up to 8 circuits from a single transformer. For this reason, the Model 55 is occasionally referred to as a "neon animator". The Model 55 is housed in a stainless steel cabinet with insulation of electrical quality glazed porcelain. The magnetic speed adjustment can vary the flashing speed from 35 to 300 flashes per circuit per minute. *This unit flashes the secondary high-voltage current. The Model 55 is a rather strong generator of Electro Magnetic Interference (EMI), sometimes referred to as Radio Frequency Interference (RFI). Various precautions can be observed to significantly reduce this interference, but it may not be totally eliminated. This potential problem should be considered when selecting installation locations. Interruption of high voltage current causes small amounts of ozone gas to be produced. The continual interruption of high voltage by the Model 55 can cause rather high concentrations of ozone gas to accumulate in insufficiently vented areas. Concentrated ozone gas had a very corrosive effect on certain materials. Brass, copper, steel and most types of paint on metal are among those materials adversely effected. Porcelain, glass, pure aluminum, and stainless steel are several materials that resist the corrosive effects of ozone gas. Install the Model 55 in well vented areas which will allow the ozone to dissipate. The Model 66 is generally used to create a scintillating or "twinkling" action in fields of flashing bulbs. They can also be wired to create a chasing action. These units are constructed of very heavy duty materials to stand up under constant use with heavy loads. The Model 66 features a simple wiring design for easy installation, and three shielded ball bearings which require no maintenance. As on all these mechanical flashers, the contacts are formed of a special silver alloy that actually performs better than pure silver. *This unit does NOT flash the secondary high-voltage current. *Dimensions: *66-C3, C4..... 7" x 6" x 4" *66-C5, C6..... 7 1/4" X 9" X 4"
*Weight: *66-C3, C4..... 7 lbs. *66-C5, C6..... 10 lbs. The flashing speed of the Model 66 can be easily adjusted by removing motor shades using just a screw driver. The flasher is supplied with a shade on each motor, and as shades are removed the flashing speed decreases. When operating with shades on (430 flashes per circuit per minute) the contacts on all Model 66 units are rated at 12.5 amps each. When operating with shades off (250 flashes per minute) the contacts on the 3 and 4 point units are rated at 20 amps each, while the contacts on the 5 and 6 point units are rated at 17.5 amps each. *Dimensions: *33-C3, C4..... 6.5" x 6" x 4 3/4" *33-C5..... 8" X 5" X 4 3/4"
*Weight: *33-C3, C4..... 5 lbs. *33-C5..... 6 lbs. The Model 33 Chasers are most commonly used on flashing incandescent bulb signs where "dark spots" chase around a border or directional motion is incorporated into a field of bulbs. The Model 33 can be used to chase neon, though it must be incorporated on the primary side of any transformers. 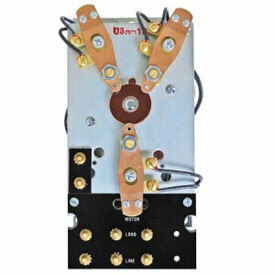 Model 33 Chasers are available from stock with three, four or five circuits. Larger chasers are available by special order. The Model 33 chasers are ruggedly constructed to provide years of smooth, quiet, trouble free service. Each features molded terminal blocks, permanently lubricated bearings, and all corrosion resistant surfaces. 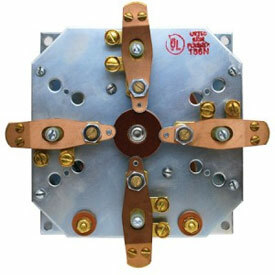 Contacts are rated to handle 10 amps each and are accessible for easy replacement. The Model 22 has proven itself over many years to be a very reliable and economical way to add on-off, alternating, or color changing effects to a sign or other device. Features include cams and points out in the open for easy replacement or adjustment. The ball bearing mounted, sealed cam shaft with large fly wheel for years of smooth, quiet, maintenance-free service. Contacts on the Model 22 are rated to handle 15 amps, except on the chaser action units whose contacts are rated at 109 amps due to high flashing speed. Model 22 High Output flashers are constructed with extra insulation and an increased point opening to minimize arcing when used in high initial draw applications such as flashing ballasts. The Model 33 Spellers are designed for applications where electric circuits are to be flashed in particular sequences such as spelling with animation. Variable in both cycle speed and cam cut, Model 33 Spellers are some of the most versatile sign controllers available. Spellers can be built with as few as one circuit, or as many as necessary to accommodate the required flashing sequence. Neon can be controlled by installing the speller on the primary side of transformers. All Model 33 Spellers are custom made. 1. NUMBER OR CIRCUIRTS Each distinct section of the items to be animated will require it's own circuit. 3. FLASHING SEQUENCE To aid you in communicating the flashing sequence wanted, we have developed the sequence charting system shown below. You can use one of these standard sequences, or develop a custom sequence of your own. Virtually any sequence can be constructed. Note: The term "cycle" refers to the time required for the flashing action to complete it's performance from start to repeat. The term "circuit" refers to the current controlled by one cam and set of contact points. while the off time by a blank square. 55-A8F where the top ceramic cap is not busted, they can usually be rebuilt to like new! 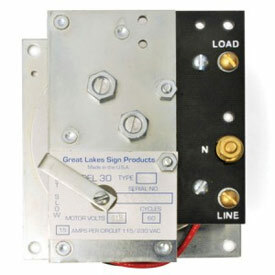 Signatrol Model 30 Flashers are standard duty On-Off flasher units with variable speed and customizable cams. The standard unit is furnished with 50% cams, (single notch) so the “ON” and “OFF” periods are of equal length. The motor speed adjustment allows the overall cycle to be varied from one revolution of the cam shaft in two seconds (30 flashes per minute) to one revolution in four seconds (15 flashes per minute). Customizable: Models with the letter “K” denote custom cam cuts that must be specified by the customer with each order. The maximum number of notches in a single cam is 15 with the minimum “OFF” period between “ON” periods being 4%. To determine the number of notches required in a cam, divide the flashes per minute you will require by 30. Example: for 120 Flashes per minute, 120/30 = 4 notches. Note: Amperage ratings are based on the connected load as well as the flashing speed. Ratings up to 100 flashes per minute are 15 Amps, up to 250 flashes are 10 Amps, over 260 flashes are 5 Amps. Signatrol Model 24 Flashers are 3 and 4 circuit, heavy-duty flashers with adjustable speed options constructed of high quality materials. They carry the same function as their Model 20 counterparts but in a slimmer design and prewired with an easy to connect terminal board. The Model 24 design features contact stacks that can be easily detached and replaced with a screw driver with no need to remove the unit from its cabinet. Heavy-duty silver alloy contacts of one half inch diameter provide for maximum life where only wiping the contacts assures positive operation. Ball-bearings throughout provide smooth operation and are sealed with aluminum covers to guard against dust and moisture. These enduring designs can be depended on for years of reliable service even in the most demanding allocations. Contacts have a 20 amp rating with 2,400 watts per channel at 250 flashes per minute. Model 24 units come with a 115 Volt Motor, 50/60 cycle. They are also available in 220 volt as a special order. Signatrol Model 20 Flashers are 3, 4, 5 or 6 circuit, heavy-duty flashers with adjustable speed options constructed of high quality materials. The Model 20 design features contact stacks that can be easily detached and replaced with a screw driver with no need to remove the unit from its cabinet. Heavy-duty silver alloy contacts of one half inch diameter provide for maximum life where only wiping the contacts assures positive operation. Ball-bearings throughout provide smooth operation and are sealed with aluminum covers to guard against dust and moisture. These enduring designs can be depended on for years of reliable service even in the most demanding allocations. Model 20 units come with a 115 Volt Motor, 50/60 cycle. They are also available in 220 volt as a special order. Signatrol flashers have been an industry standard and the “go-to” unit for decades. Constructed of high quality materials, these enduring designs can be depended upon for years of reliable service, even in the most demanding applications. We offer the legendary Model 20, Model 24 and Model 30 units, along with original replacement parts. Choose from standard or pre-wired terminal board models. ... both Proudly Made in the USA! Manufactured in the USA since the 1950's. If you require more than 20+ circuits, a solid-state unit can be built. Call for pricing. Item# AN - Movable Contact $16 ea. *Model 22-C3 is Discontinued and sold out. Item# AM - Movable Contact $16 ea. Item# EH - Movable Contact $34 ea. Replaced by FMS 33-C4 *see way above in FMS section "Model 33 Chaser"